What caught my attention was that almost all of them (adblock plus, ublock origin etc.) fail to block “CoinNebula”. Unlike Coinhive which loads from coinhive website, CoinNebula library is hosted on the same server as the website. This makes it a little bit hard to block. 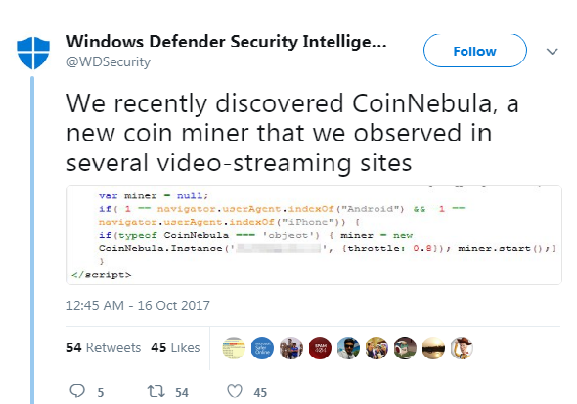 So without wasting anyone’s time, Let’s start our mission to stop CoinNebula for good. You need to install Ubock Origin on your Firefox or Chrome browser. I suppose you can also do it with Adblock plus but not really sure. Click on Ublock Origin icon and then “open the dashboard”. Click on “my filters” tab. Now what we need to do is use the “Inline script tag filtering” feature of uBlock origin. You can understand and implement it easily by going to official github page of uBlock. However here’s the thing though: What we are trying to achieve is to only block the inline script related to crypto mining. Simply blocking all the inline scripts will hinder the experience and you may even experience problems in loading the web page. So what we need to do is to use cosmetic filtering. Replace example.com with the domain name of the site from where you want to block the CoinNebula. Simple add the above 2 rules in “My Filters” tab and click on “Apply changes”. If you noticed, I have added 2 rules while all we need is just 1 rule. I just added another one to be extra sure because no one wants their precious CPU resources to be used without consent. I have tested it on both Firefox and Chromium based browsers and it gets the job done. Let me know in comments if this works out for you or you are facing any problems.